I'm back from convention and it was amazing. I'm still reeling from all the projects and things I learned. I'll post some of my swaps over the next few days but first, I thought I would share a super fast 3"x3" card that you can make at home. The stamp set is called Pedaling Past from the Summer Mini Catalog. The card uses Textured So Saffron card stock. Poppy Parade and Chocolate Chip card stock. The ink colors are Chocolate Chip and Poppy Parade. 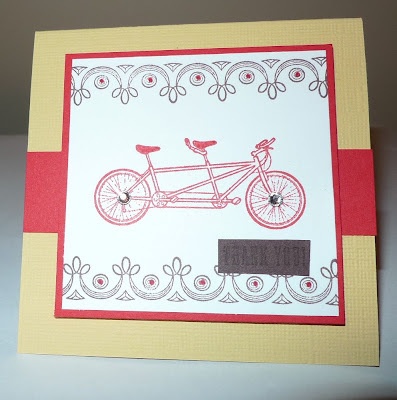 I used a Poppy Parade Stampin Write Marker to highlight the dots in the scroll image and color in the bike seats. I love the rhinestones on the spokes of the bike wheel. They are only $6.50 for 150 rhinestones. They have adhesive on the back so they are easy to use.